All the benefits of the Tradesman Metal XL wheelbarrow, but with a puncture-proof wheel. 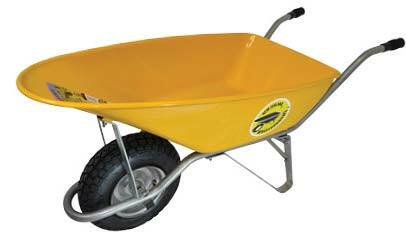 The Tradesman Metal XLis a premium metal wheelbarrow for the construction industry. If a wheelbarrow can have aptitude, style and good looks, this is it. The tray is galvanised and then painted safety yellow for durability and high visibility on construction sites. The cantilevered, focused, jug-like pourer spout makes light work of placing concrete.